First Form of Worship: Belief in Demons. The Rôle of the Serpent. Clean and Unclean Animals Contrasted. Third or Symbolic Type of Worship. This is an expression which needs careful definition, since it is understood and explained in various ways. A distinction has to be made between a strict and a loose employment of the expression. On the one hand, a difference must be noted between actual devotion to, or service of, an object and the mere recognition of such an object as divine or supernatural. On the other hand, care must be taken to avoid confounding the direct worship of an animal with the use of the animal as a symbol of the real object of worship. 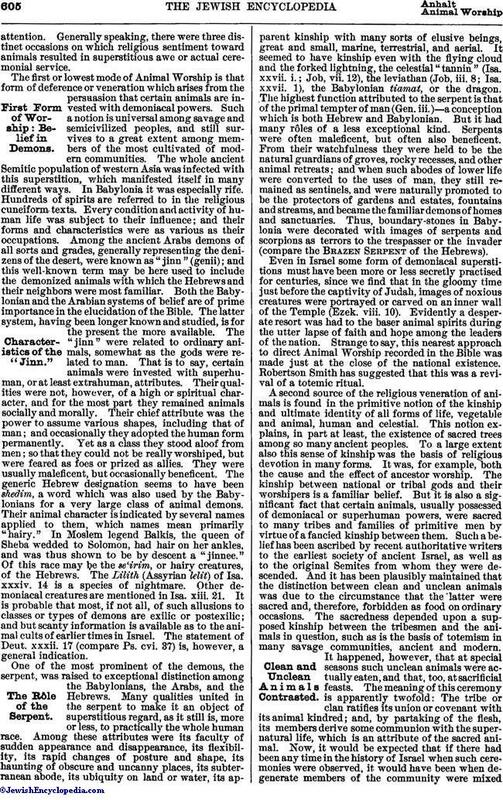 In the strictest sense of the words, it is doubtful whether Animal Worship ever existed in any large portion of the Hebrew community; but, in a wider sense, there were instances which are worthy of closeattention. Generally speaking, there were three distinct occasions on which religious sentiment toward animals resulted in superstitious awe or actual ceremonial service. The first or lowest mode of Animal Worship is that form of deference or veneration which arises from the persuasion that certain animals are invested with demoniacal powers. Such a notion is universal among savage and semicivilized peoples, and still survives to a great extent among members of the most cultivated of modern communities. The whole ancient Semitic population of western Asia was infected with this superstition, which manifested itself in many different ways. In Babylonia it was especially rife. Hundreds of spirits are referred to in the religious cuneiform texts. Every condition and activity of human life was subject to their influence; and their forms and characteristics were as various as their occupations. Among the ancient Arabs demons of all sorts and grades, generally representing the denizens of the desert, were known as "jinn" (genii); and this well-known term may be here used to include the demonized animals with which the Hebrews and their neighbors were most familiar. Both the Babylonian and the Arabian systems of belief are of prime importance in the elucidation of the Bible. The latter system, having been longer known and studied, is for the present the more available. The "jinn" were related to ordinary animals, somewhat as the gods were related to man. That is to say, certain animals were invested with superhuman, or at least extrahuman, attributes. Their qualities were not, however, of a high or spiritual character, and for the most part they remained animals socially and morally. Their chief attribute was the power to assume various shapes, including that of man; and occasionally they adopted the human form permanently. Yet as a class they stood aloof from men; so that they could not be really worshiped, but were feared as foes or prized as allies. They were usually maleficent, but occasionally beneficent. 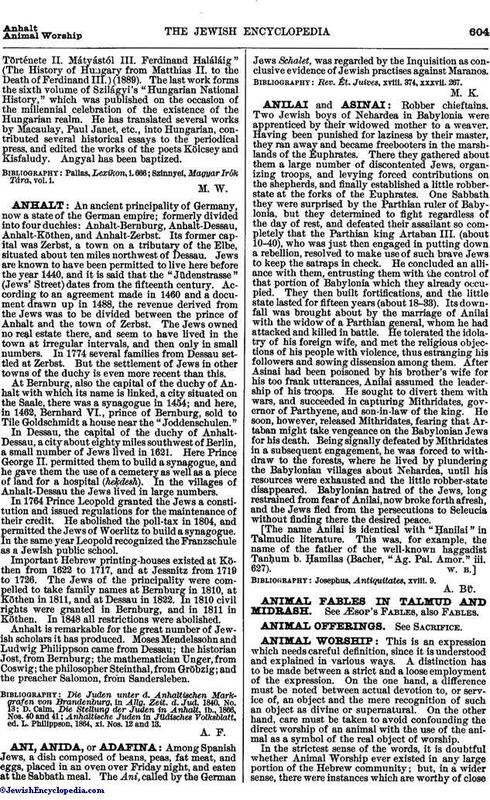 The generic Hebrew designation seems to have been shedim, a word which was also used by the Babylonians for a very large class of animal demons. Their animal character is indicated by several names applied to them, which names mean primarily "hairy." In Moslem legend Balkis, the queen of Sheba wedded to Solomon, had hair on her ankles, and was thus shown to be by descent a "jinnee." Of this race may be the se'irim, or hairy creatures, of the Hebrews. The Lilith (Assyrian lelit) of Isa. xxxiv. 14 is a species of nightmare. Other demoniacal creatures are mentioned in Isa. xiii. 21. It is probable that most, if not all, of such allusions to classes or types of demons are exilic or postexilic; and but scanty information is available as to the animal cults of earlier times in Israel. The statement of Deut. xxxii. 17 (compare Ps. cvi. 37) is, however, a general indication. One of the most prominent of the demons, the serpent, was raised to exceptional distinction among the Babylonians, the Arabs, and the Hebrews. Many qualities united in the serpent to make it an object of superstitious regard, as it still is, more or less, to practically the whole human race. Among these attributes were its faculty of sudden appearance and disappearance, its flexibility, its rapid changes of posture and shape, its haunting of obscure and uncanny places, its subterranean abode, its ubiquity on land or water, its apparent kinship with many sorts of elusive beings, great and small, marine, terrestrial, and aerial. It seemed to have kinship even with the flying cloud and the forked lightning, the celestial "tannin" (Isa. xxvii. i.; Job, vii. 12), the leviathan (Job, iii. 8; Isa. xxvii. 1), the Babylonian tiamat, or the dragon. The highest function attributed to the serpent is that of the primal tempter of man (Gen. iii. )—a conception which is both Hebrew and Babylonian. But it had many rôles of a less exceptional kind. Serpents were often maleficent, but often also beneficent. From their watchfulness they were held to be the natural guardians of groves, rocky recesses, and other animal retreats; and when such abodes of lower life were converted to the uses of man, they still remained as sentinels, and were naturally promoted to be the protectors of gardens and estates, fountains and streams, and became the familiar demons of homes and sanctuaries. Thus, boundary-stones in Babylonia were decorated with images of serpents and scorpions as terrors to the trespasser or the invader (compare the Brazen Serpent of the Hebrews). Even in Israel some form of demoniacal superstitions must have been more or less secretly practised for centuries, since we find that in the gloomy time just before the captivity of Judah, images of noxious creatures were portrayed or carved on an inner wall of the Temple (Ezek. viii. 10). Evidently a desperate resort was had to the baser animal spirits during the utter lapse of faith and hope among the leaders of the nation. Strange to say, this nearest approach to direct Animal Worship recorded in the Bible was made just at the close of the national existence. Robertson Smith has suggested that this was a revival of a totemic ritual. A second source of the religious veneration of animals is found in the primitive notion of the kinship and ultimate identity of all forms of life, vegetable and animal, human and celestial. This notion explains, in part at least, the existence of sacred trees among so many ancient peoples. To a large extent also this sense of kinship was the basis of religious devotion in many forms. It was, for example, both the cause and the effect of ancestor worship. The kinship between national or tribal gods and their worshipers is a familiar belief. But it is also a significant fact that certain animals, usually possessed of demoniacal or superhuman powers, were sacred to many tribes and families of primitive men by virtue of a fancied kinship between them. Such a belief has been ascribed by recent authoritative writers to the earliest society of ancient Israel, as well as to the original Semites from whom they were descended. And it has been plausibly maintained that the distinction between clean and unclean animals was due to the circumstance that the latter were sacred and, therefore, forbidden as food on ordinary occasions. The sacredness depended upon a supposed kinship between the tribesmen and the animals in question, such as is the basis of totemism in many savage communities, ancient and modern. It happened, however, that at special seasons such unclean animals were actually eaten, and that, too, at sacrificial feasts. The meaning of this ceremony is apparently twofold: The tribe or clan ratifies its union or covenant with its animal kindred; and, by partaking of the flesh, its members derive some communion with the supernatural life, which is an attribute of the sacred animal. Now, it would be expected that if there had been any time in the history of Israel when such ceremonies were observed, it would have been when degenerate members of the community were mixedwith a heathen population. Such a time occurred toward the end of the Exile, described in Isa. lxv. and lxvi., when swine and dogs and mice, the most unclean of animals, were eaten by certain Hebrews living among the Babylonians. It is more than a coincidence that in the Bible and elsewhere these very animals have specially demoniacal qualities or associations. The third cause of the religious veneration of animals is the desire to have acknowledged deities, as distinguished from mere demons, represented by some visible, tangible object or image, which may impress the imagination and excite faith and devotion. This does not refer to the deities that may have been developed out of the "jinn," or animal demons, and which thus continued to image forth, in the form in which they were adored, the original animal whose supposed spiritual essence swayed the credulous fancy of an earlier people, but rather to those prominent instances of animal cults in which the qualities of great national or tribal gods are symbolically expressed by the characteristics of certain animals chosen as their visible representatives. The typical Biblical instance is that of the so-called bullor calf-worship of northern Israel, with which may be included the worship of the golden calf made by Aaron before Mount Sinai. This latter is of importance in so far as it shows the traditional and inveterate character of the cult, since Ex. xxxii. was probably intended for illustrative purposes and as a prophetic object-lesson. The explanation of this influential cult is wide and comprehensive. Israel was heir to many forms of Semitic belief; and religious symbolism had begun in early ages among peoples to which, both through racial descent and historic association, Israel owed much of its culture. 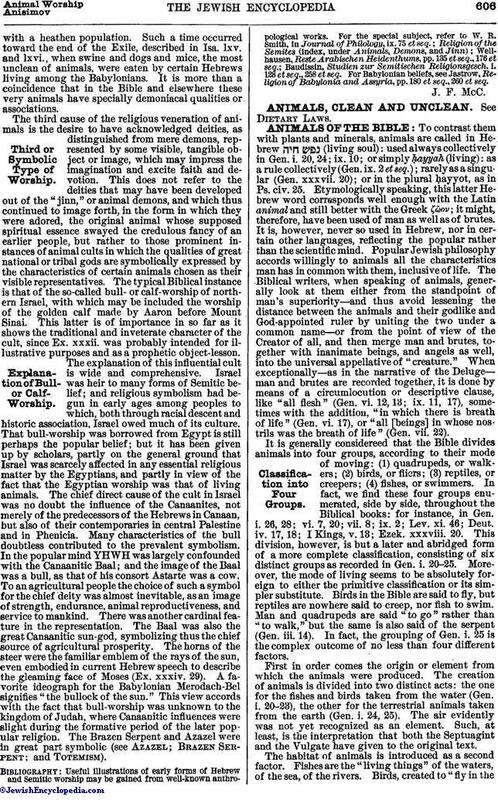 That bull-worship was borrowed from Egypt is still perhaps the popular belief; but it has been given up by scholars, partly on the general ground that Israel was scarcely affected in any essential religious matter by the Egyptians, and partly in view of the fact that the Egyptian worship was that of living animals. The chief direct cause of the cult in Israel was no doubt the influence of the Canaanites, not merely of the predecessors of the Hebrews in Canaan, but also of their contemporaries in central Palestine and in Phenicia. Many characteristics of the bull doubtless contributed to the prevalent symbolism. In the popular mind YHWH was largely confounded with the Canaanitic Baal; and the image of the Baal was a bull, as that of his consort Astarte was a cow. To an agricultural people the choice of such a symbol for the chief deity was almost inevitable, as an image of strength, endurance, animal reproductiveness, and service to mankind. There was another cardinal feature in the representation. The Baal was also the great Canaanitic sun-god, symbolizing thus the chief source of agricultural prosperity. The horns of the steer were the familiar emblem of the rays of the sun, even embodied in current Hebrew speech to describe the gleaming face of Moses (Ex. xxxiv. 29). A favorite ideograph for the Babylonian Merodach-Bel signifies "the bullock of the sun." This view accords with the fact that bull-worship was unknown to the kingdom of Judah, where Canaanitic influences were slight during the formative period of the later popular religion. The Brazen Serpent and Azazel were in great part symbolic (see Azazel; Brazen Serpent; and Totemism). Baudissin, Studien zur Semitischen Religionsgesch. i. 128 et seq., 258 et seq. For Babylonian beliefs, see Jastrow, Religion of Babylonia and Assyria, pp. 180 et seq., 260 et seq.